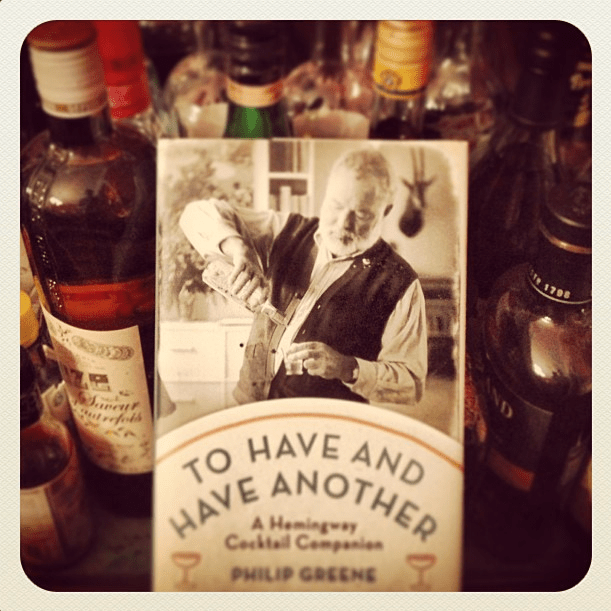 Ever on the hunt for interesting cocktails and the stories that go along with them, I recently picked up the book, To Have and Have Another: A Hemingway Cocktail Companion , by Philip Greene. It certainly helps to know some Hemingway if you want to get the most out of this cocktail book, but anyone with an interest in the drinking culture of the 1930’s-1950’s will find at least a few good stories and recipes as well. The book is organized by drink – with a recipe for each, and how the drink fits into the Hemingway oeuvre (or his life beyond the pages of his books). There are entries for the Daiquiri (of course), the Cuba Libre, the Americano… but also more unusual drinks (at least to modern tipplers) like the Gambler’s Delight and the El Definitivo. And there are a number of super simple concoctions like gin and coconut water, or Scotch and lime juice, or Armagnac and soda. 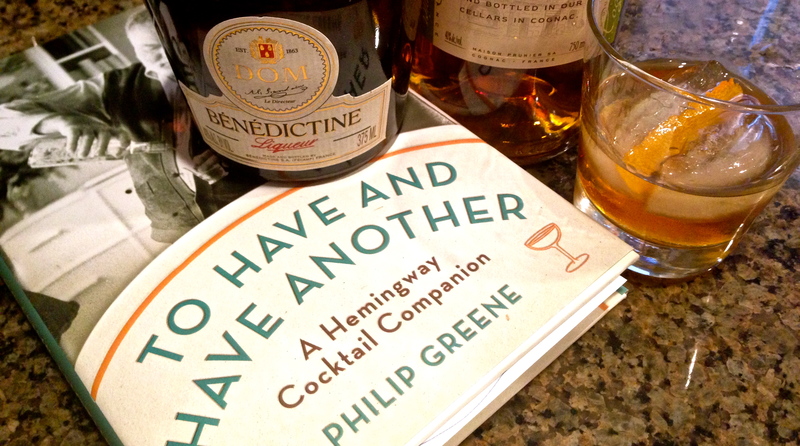 Which brings us to… the Cognac and Benedictine. This drink is a 1 to 1 blend of Cognac and Benedectine, an herb and spice-laden liqueur from France that began production in the 1860’s but traces its roots back to the 1500’s. The story goes (and don’t ever fully believe any story about spirits like Benedictine) that this liqueur was originally imbibed by the monks of the Benedictine Abbey of Fécamp in Normandy in the early 1500’s. After the production ceased for a few hundred years, a fellow by the name of Alexandre Le Grand revived the recipe (or at least created the backstory). By the 1930’s, one of the popular uses for Benedictine was in a Benedictine and brandy (B&B), and the company behind it came out with their own bottled version of B&B (you can still get that today, but buying the pure Benedictine is the way to go, so you can use it in cocktails like the Vieux Carre or the Singapore Sling). Now, Cognac is a specific type of brandy, so the Cognac and Benedictine is basically a (better) B&B. Made with a good Cognac, this is a lovely drink, a touch syrupy, but full of intrigue from the herbs and spices in the liqueur. So what does this have to do with Hemingway? Turns out, young Ernest wrote a bunch of short stories upon his return home to the States after serving in the ambulance corps in Italy during World War I. One of these stories was set in a dive bar in Chicago, and prominently features the Cognac and Benedictine amidst tales of wartime in Sicily and the wishes of the Royal Republican Chilean Army. Intrigued? Try it yourself. Ernest would be happy to know it was because of him. Mix equal parts Cognac and Benedictine in an Old Fashioned glass over ice, stir and garnish with a lemon peel. Enjoy. I was browsing the latest issue of Imbibe Magazine and came across a cocktail recipe by Robert Ortenzio, from Yardbird in Miami, that intrigued me. 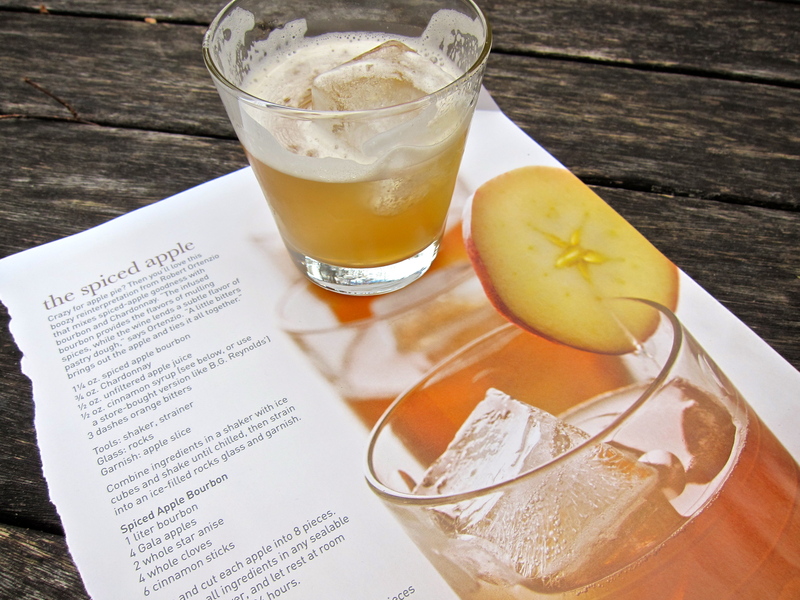 I was actually highly skeptical of the recipe, called “the spiced apple,” since I tend to like my cocktails strong and this one called for 3/4 oz chardonnay along with 1/2 oz cinnamon syrup and 1/2 oz apple juice (oh, and some bourbon). It sounded too sweet and too strange to work, but… part of the recipe involved infusing bourbon with apple and spices, and I had been wanting to try that. So… I started with infusing some bourbon. Basically, you take some bourbon, not too expensive (Old Charter 8 year old was my choice), cut up some apples, throw in some spices, and let it all hang out together for a mere 24 hours. What you get after one short day is bourbon with a very evident cinnamon kick, and less evident (though still there) apples and baking spice. I had heard that cinnamon infuses quickly and can quickly overpower whatever spirit you’re combining it with, and this short infusion proved that one single day is about right. Once I had the spiced bourbon, I decided to keep going with the recipe, tackling the equally easy and even quicker cinnamon syrup – which is basically simple syrup that mingles with cinnamon sticks for about 10 minutes to get an added boost of flavor. It turned out quite nice, and super easy. So now that I had my spiced bourbon, and my cinnamon syrup, I decided to just go ahead and give the cocktail a shot. Spiced bourbon – check. Chardonnay – a cheap bottle from Trader Joe’s, intentionally buttery to add an apple pie crust twist to the cocktail. 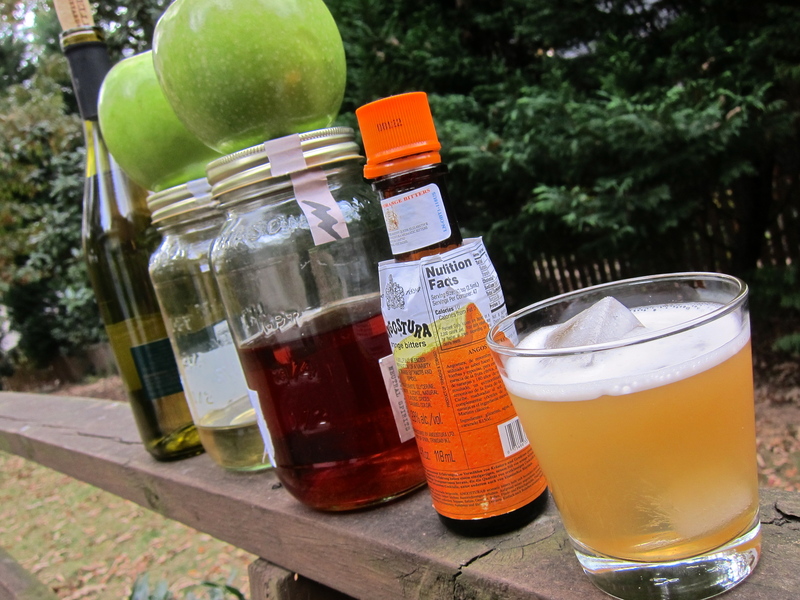 Apple juice – some Mott’s Natural will do. Cinnamon syrup – done. Orange bitters – got it. I shook it all up over ice, expecting disaster. All that sweetness can’t work, can it? I took a hesitant sip. Then another. Then another. Hot dang, this is actually really good. Every ingredient brings something to the table, from the kick of the bourbon to the bit of oak and butter in the wine to the juicy, um, apple juice, to the lively bitters, to the extra sugar and spice in the syrup. Not too sweet, not too strong, just a really nice autumn cocktail. Well done Robert Ortenzio. You have won me over with apple juice and chardonnay. And bourbon. P.S. I also tried the drink hot, as the magazine suggested, which ends up tasting a bit like a cross between apple cider and a hot toddy. I like it cold better. Combine all ingredients in a shaker over ice, shake vigorously, then strain into a rocks glass over ice. Optional garnish with a thin slice of apple. *To make spiced apple bourbon, combine 1/2 l bourbon with 2 apples (cut into large pieces, core removed), 3 whole cloves, 4 cinnamon sticks, and 2 whole star anise (or 1/4 tsp anise seed), let sit for 24 hours in a covered glass container, then filter out all solids. That’s it! Feel free to play with the spices. **To make cinnamon syrup, combine 1/2 cup water, 1/2 cup sugar, and 3 cinnamon sticks broken into large pieces. Bring to boil over medium heat, then reduce to simmer for 10 minutes, stirring frequently. Remove from heat, let cool, then remove cinnamon. Can be stored in a glass jar in refrigerator for up to 2 weeks. I blame it on Boozehound. The fact that I have a bottle of Crème de Violette, that is. I never knew I needed it until I read Jason Wilson’s account of the Aviation cocktail, a classic that apparently lost its way and fell from the sky. Until a few years ago, most recipes for an Aviation called for gin, maraschino liqueur, and lemon juice. Few had any clue why it was called an Aviation. Then someone dug up the fact that the original called for Crème de Violette, a deep purple-y blue bloom of floral intensity that does indeed turn the cocktail the color of a pale, hazy blue sky. (That’s a fairly crappy photo of a Blue Moon pictured above, not an Aviation – hold your horses, we’ll get to that in a minute). Turns out, Crème de Violette was practically non-existant for decades until being revived in the past several years, and we have Eric Seed of Haus Alpenz to thank for bringing Rothman & Winter Crème de Violette back into obsessive bars all over. The Rothman & Winter Crème de Violette is distilled in Austria by Destillerie Purkhart, a maceration of two types of violets in “weinbrand,” a liqueur distilled from grapes, with some cane sugar added. It’s worth pointing out that the color is not fully derived from the violets – there is coloring added, too. This Crème de Violette is intense, perfumey stuff – it doesn’t have the easy appeal of the honeysuckle sweet St. Germain Elderflower Liqueur – so it needs to be used in small, careful doses. Also, it seems to work especially well with dry gin – the Aviation and the Blue Moon are both gin-based cocktails, as are a few other lesser known cocktails like the Jupiter and the Yale cocktail (beware blue Curacao, be true to Crème de Violette). light shine through in an appealing way. Despite the fact that the Crème de Violette is a minor ingredient, a floral smell dominates the nose. Cherry is there, as is the angular spice of the gin, but it’s those violets that jump to the forefront. As you taste the cocktail, a tart, crisp, mouth watering, citrusy burst hits first. Then the cherry rolls in, the flowers come in again at the end, and the gin provides a steady bass line throughout. Rothman & Winter’s rendition of the Aviation recipe calls for less lemon juice, less maraschino, and MORE Crème de Violette (not surprising, really, they love the stuff!). Personally, I prefer to up the gin to 2oz (following the rest of the recipe in Boozehound) to pull back the floral notes and cherry into more of a balanced dance with the gin. It’s a lovely drink, unique, but rewards playing around with the ratios to suit your tastes. As for the Blue Moon (pictured up top), it’s very similar to the Aviation, but with more gin (2oz), 1/2oz each of the lemon juice and Crème de Violette, and NO maraschino. The color stays roughly the same strange lavender-blue hue, but the gin is indeed more prominent on the nose here. On the outset, I find the Blue Moon a bit more balanced overall, with the lemon acidity in check. But that gin seems to come on a bit too strong towards the finish, throwing that balance off. When I was playing with this one, I went back and added the maraschino into the mix, and really felt that kicked up the body, complexity, and nuance of the drink, actually propelling the floral notes forward in a positive way. So, yes, I prefer a ride on the Aviation, keeping the maraschino in. Of course, if you’re not into gin (what, are you crazy? 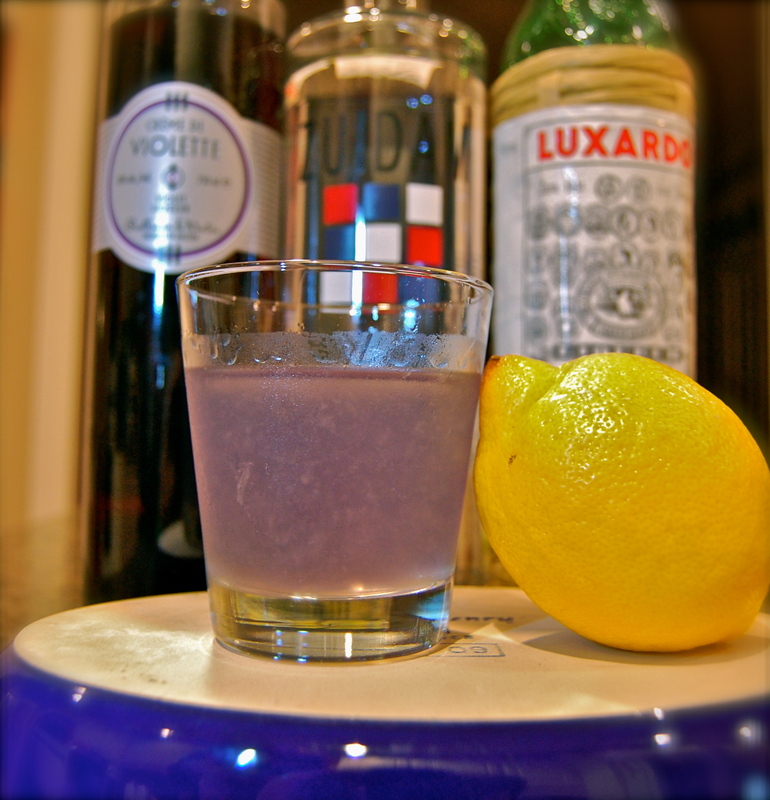 ), there’s the basic Violette Royale – 4oz Champagne and 1/2oz Crème de Violette. Now, if you’re not into Champagne either, don’t bother buying that bottle of Crème de Violette.